New Jersey resident Alaa Saadeh belonged to a group of alleged U.S.-based ISIS supporters and would-be foreign fighters that included his younger brother, Nader Saadeh, Samuel Rahamin Topaz, and others. The FBI arrested Saadeh on June 29, 2015.“New Jersey Man Charged With Conspiracy To Provide Material Support To ISIL And Witness Tampering,” U.S. Department of Justice, June 29, 2015, http://www.justice.gov/usao-nj/pr/new-jersey-man-charged-conspiracy-provide-material-support-isil-and-witness-tamperings. Following his arrest, Saadeh told the FBI that he, Nader Saadeh, and Topaz watched ISIS propaganda videos together and planned to join the terrorist group abroad.“United States of America v. Nader Saadeh,” U.S. District Court District of New Jersey, August 1, 2015, http://www.justice.gov/opa/file/705621/download. Saadeh was charged with conspiring to provide services and personnel to ISIS, aiding and abetting an attempt to provide services and personnel to ISIS, and attempting to persuade a witness to lie to the FBI.“New Jersey Man Charged With Conspiracy To Provide Material Support To ISIL And Witness Tampering,” U.S. Department of Justice, June 29, 2015, http://www.justice.gov/usao-nj/pr/new-jersey-man-charged-conspiracy-provide-material-support-isil-and-witness-tamperings. During the trial, Saadeh admitted to providing credit cards and other materials to members of the New Jersey cell in order to facilitate their travel to ISIS-held territory. Saadeh pled guilty to providing material support to a terrorist organization in October 2015. In May 2016, Saadeh was sentenced to 15 years in prison and a lifetime of supervised release.Jonathan Dienst, “NJ Man Who Tried to Help Organize 'Small Army' For ISIS Gets 15 Years in Prison,” NBC News, May 10, 2016, http://www.nbcnewyork.com/news/local/ISIS-Fighter-Suspect-Sentenced-Prison-New-Jersey-Alaa-Saadeh-NJ-378837431.html. Saadeh had no criminal record prior to his arrest.Jonathan Dienst, “NJ Man Who Tried to Help Organize 'Small Army' For ISIS Gets 15 Years in Prison,” NBC News, May 10, 2016, http://www.nbcnewyork.com/news/local/ISIS-Fighter-Suspect-Sentenced-Prison-New-Jersey-Alaa-Saadeh-NJ-378837431.html. 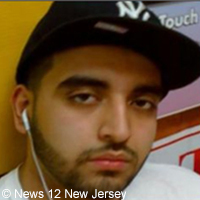 His parents, however, had previously been deported from the United States for credit card fraud.“New Jersey Man Charged With Conspiracy To Provide Material Support To ISIL And Witness Tampering,” U.S. Department of Justice, June 29, 2015, http://www.justice.gov/usao-nj/pr/new-jersey-man-charged-conspiracy-provide-material-support-isil-and-witness-tamperings; Ted Sherman, “Jersey Jihad: Inside the ISIS case that snared 5 friends,” NJ.com, July 27, 2015, http://www.nj.com/news/index.ssf/2015/07/jersey_jihad_inside_the_isis_case_that_ensnared_5.html. As of April 2015, the Saadehs’ father lived in Oman and their mother lived in Jordan. Following their parents’ deportation, the Saadeh boys lived with a person identified in the complaint as “Individual 1.” The individual informed the FBI in April 2015 of the Saadehs’ plans to join ISIS. According to the Saadehs’ criminal complaints, Alaa Saadeh was “on the fence” about going to ISIS-held territory, but Nader Saadeh swayed him. Nader Saadeh flew to Jordan on May 5, 2015, with the intention of later meeting his brother and Topaz in Turkey to cross over into ISIS-held territory. After Nader Saadeh was detained in Jordan, the elder Saadeh allegedly told Individual 1 to “play stupid” about the Saadehs’ plans to join ISIS.“New Jersey Man Charged With Conspiracy To Provide Material Support To ISIL And Witness Tampering,” U.S. Department of Justice, June 29, 2015, http://www.justice.gov/usao-nj/pr/new-jersey-man-charged-conspiracy-provide-material-support-isil-and-witness-tamperings. Abbott Koloff, “Former Bergen County man gets 15 years for conspiring to aid Islamic State,” May 10, 2016, http://www.northjersey.com/news/former-bergen-county-man-gets-15-years-for-conspiring-to-aid-islamic-state-1.1569691. New Jersey resident Alaa Saadeh belonged to a group of alleged U.S.-based ISIS supporters and would-be foreign fighters that included his younger brother, Nader Saadeh, Samuel Rahamin Topaz, and others. “If I think they’re good, why not?”“New Jersey Man Charged With Conspiracy To Provide Material Support To ISIL And Witness Tampering,” U.S. Department of Justice, June 29, 2015, http://www.justice.gov/usao-nj/pr/new-jersey-man-charged-conspiracy-provide-material-support-isil-and-witness-tampering.